To some this may look like work or just a pile of lumber but to a little boy it looks like adventure and happiness in a tree house! 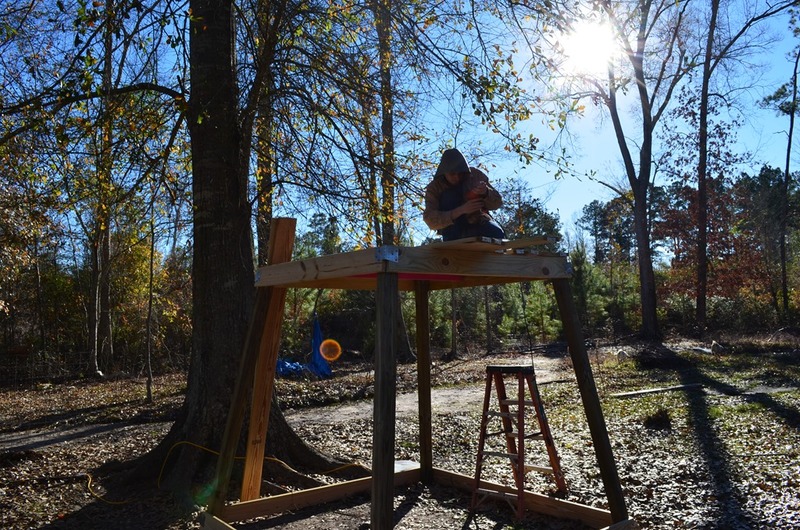 Our youngest had been wanting a tree house for a few years now and we just never seemed to get it done, partially because the money never seems to be there when you want that “extra money” to do a big-ish project and partially because I was afraid my darling son would hurt himself falling out of the silly thing. This year I finally decided maybe my rambunctious youngest was old enough to handle the responsibility of a tree house. So we started construction! 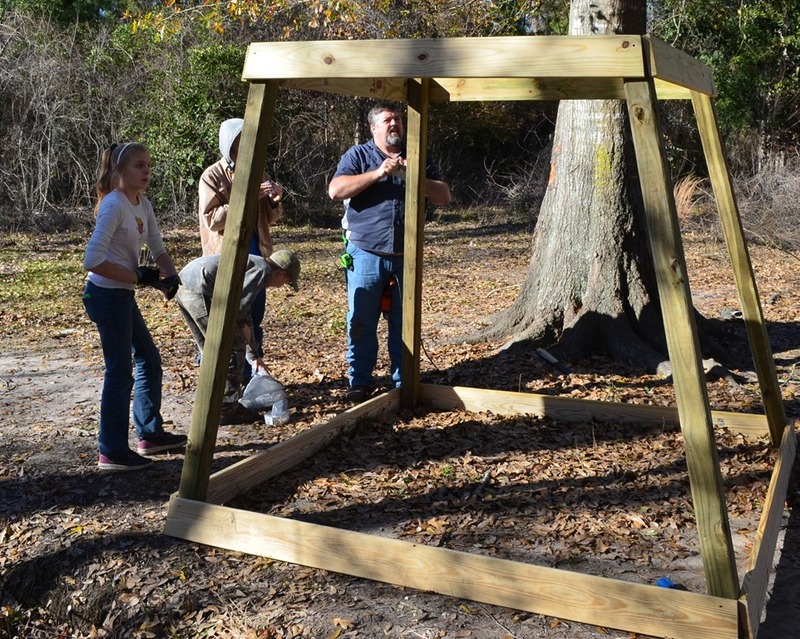 I love that my kids pitch in to accomplish a goal, with dad’s watchful eye and woodworking wisdom, a platform was quickly erected. The idea was to re-use pallets to make the walls. But that, my friend, turned out to be harder than expected! 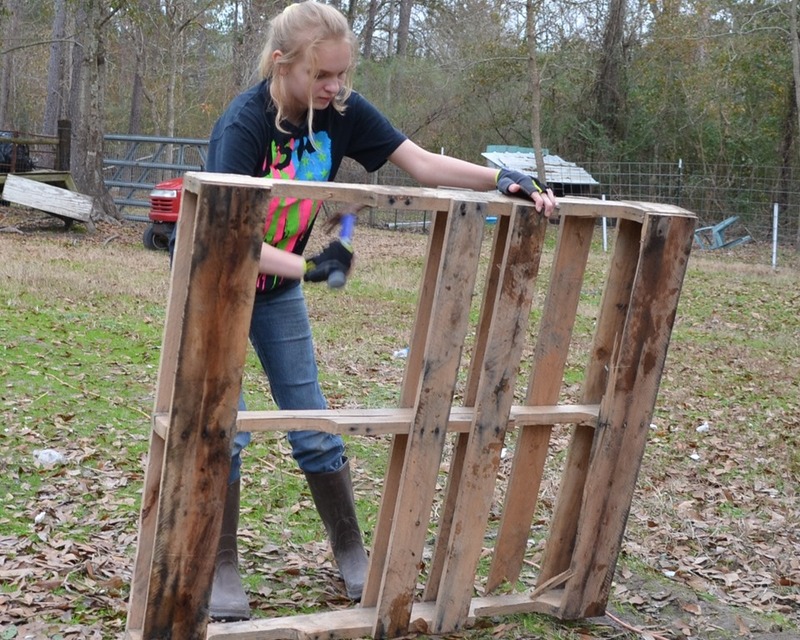 Those pallet slats are very hard to pry off. More busted and cracked than didn’t. Even if my daughter does look like she is serious about her job! 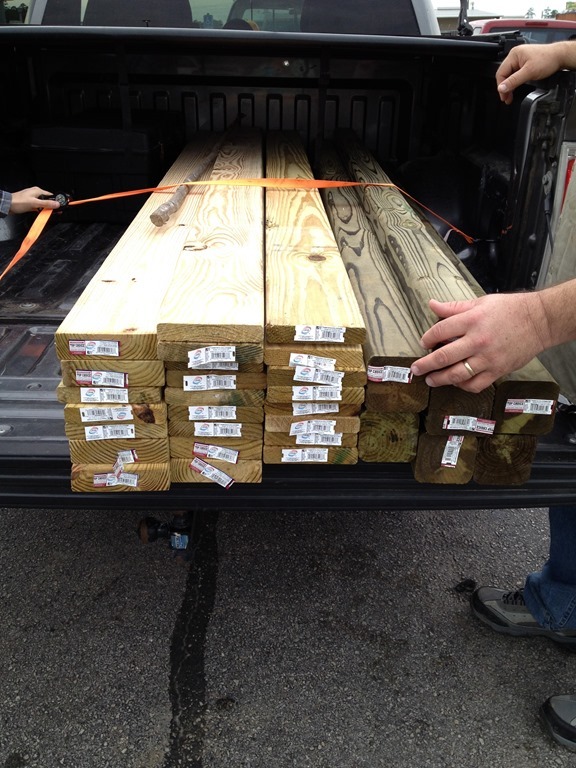 The boys placed the few slats we could get off, along one side where the “dungeon” was going to be. Hubby added a trap door to the dungeon, a happy lil boy pops out! 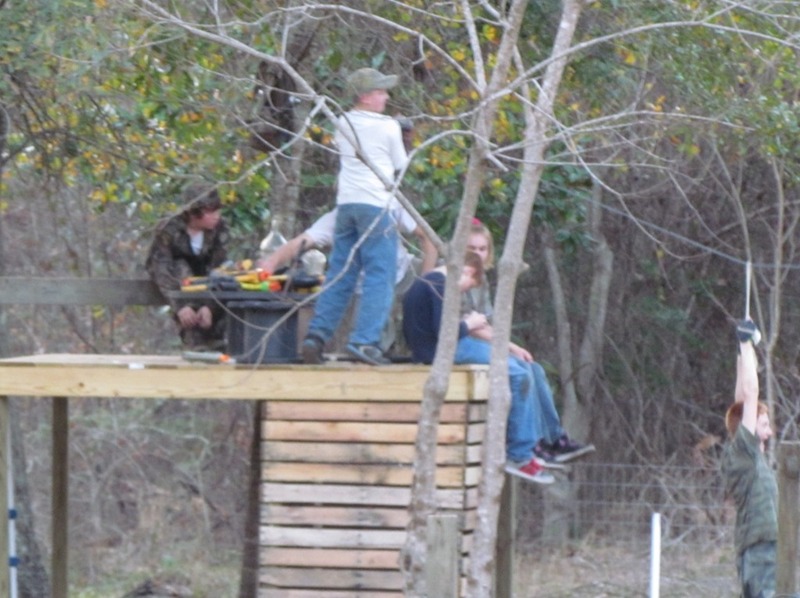 It didn’t take long before the neighborhood boys had to come play in the “tree house”! They don’t seem to mind it is only a platform and a dungeon! In the midst of the work my kids do not even notice they are learning math skills while they are taking measurements, and marking angles. Learning happens best when it is natural! 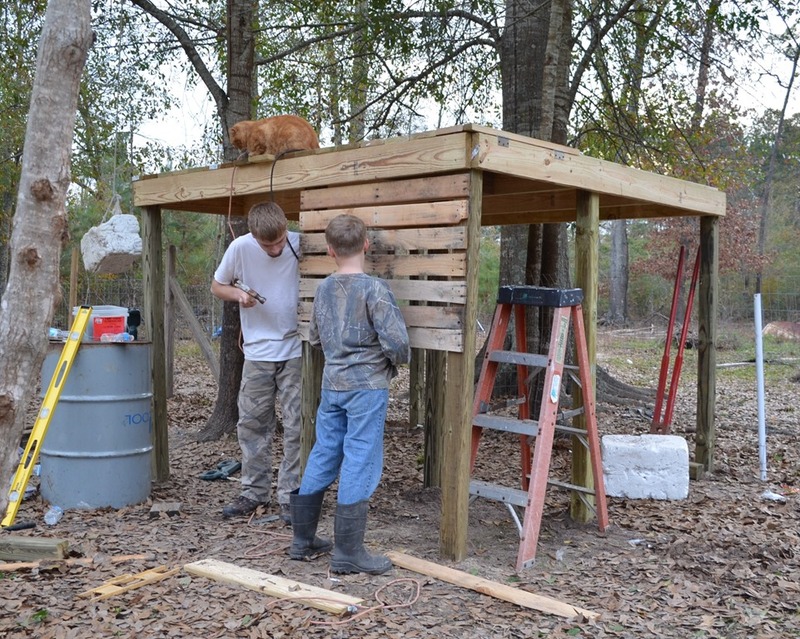 We had planned on building the “tree house” on top of the platform in the nook of three trees (because we don’t have a gnarly old tree to actually build a house in the branches) but my youngest son didn’t want to give up space on the platform where he and all his friend hang out so we opted for a free standing “house” apart from the platform. 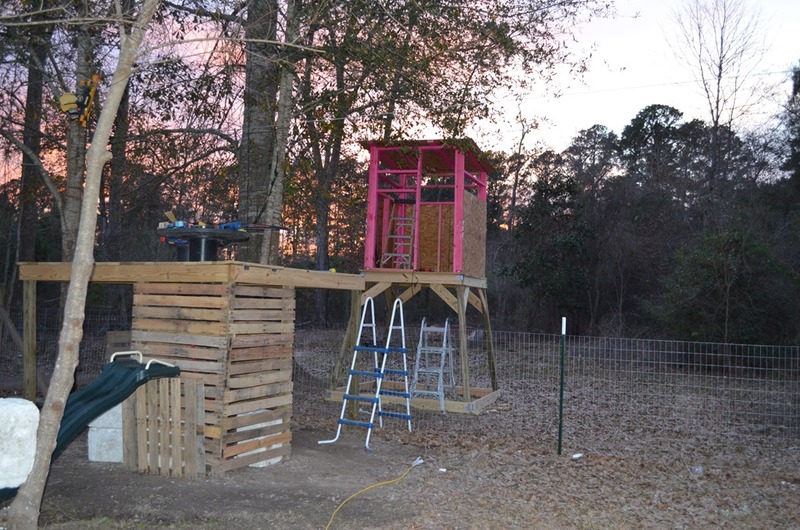 Hubby had the idea to make it look like a cottage, but my boys said no, that it needed to look more “fort-ish” …so “deer stand” it is! 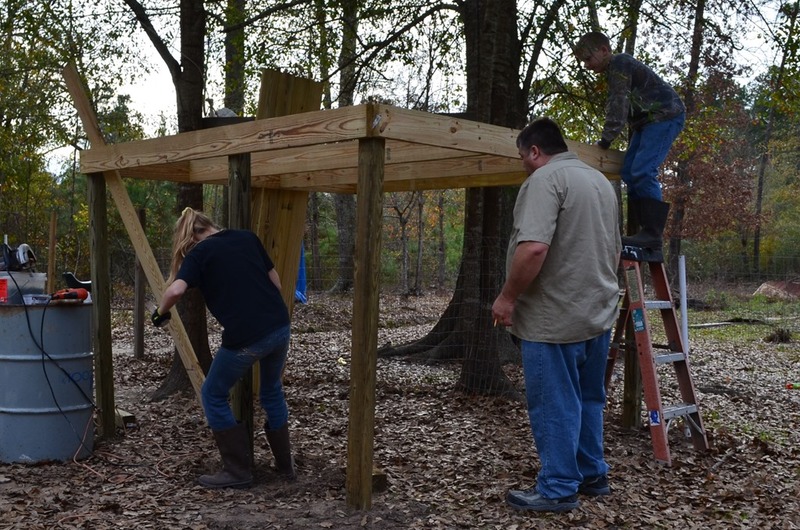 Our eldest laid another foundation much like the one on the platform. 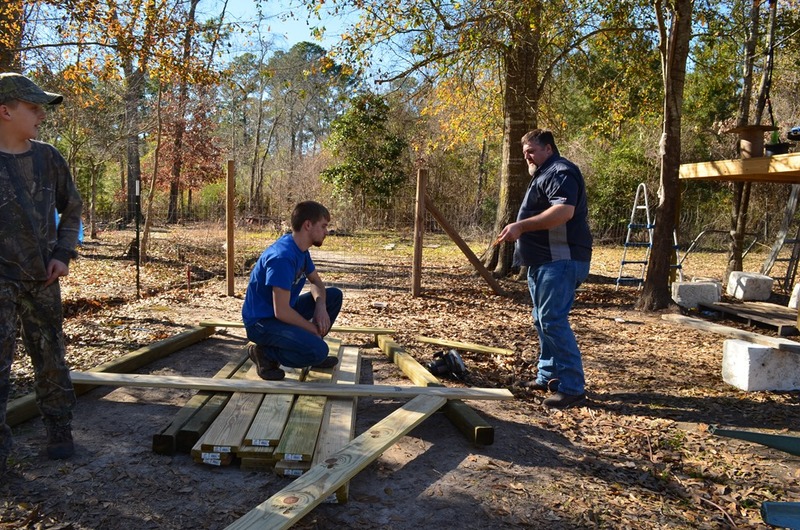 We assembled each wall side and then lifted it up and fastened it to the foundation. We wanted to make a rope bridge from the platform to the “deer stand” but over-cautious mom thinks it would be too dangerous. 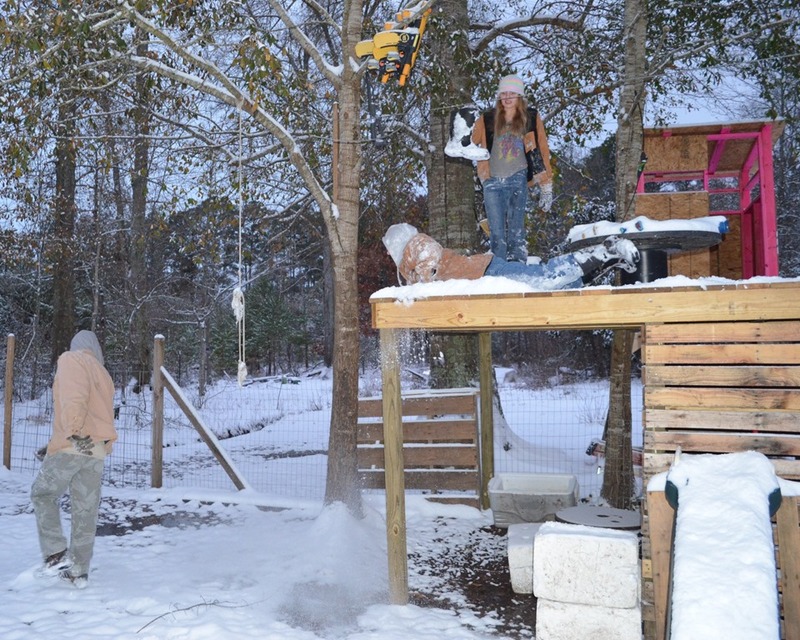 We had a few real winter “snow days” here in Texas (very unusual) so we had to stop construction, but the kids didn’t complain, they were having to much fun in the snow! 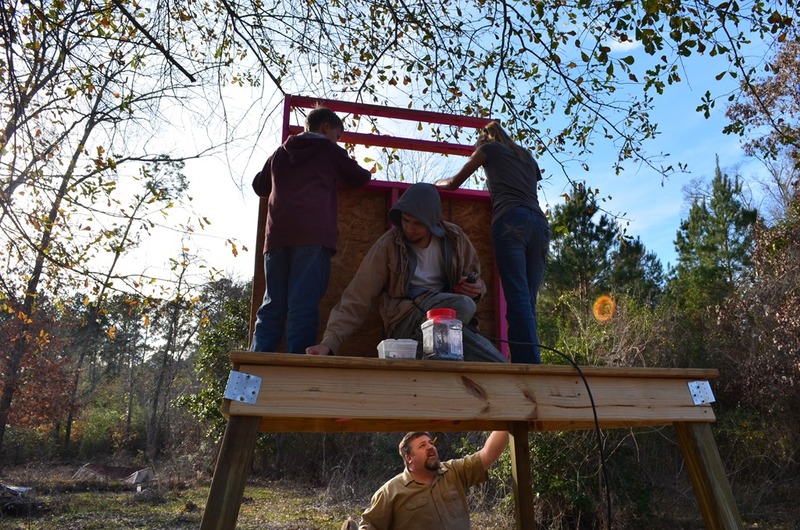 Now that spring is right around the corner maybe we can get the play house completely finished! Including a small zip line! These are some great kiddos! My three, plus three! 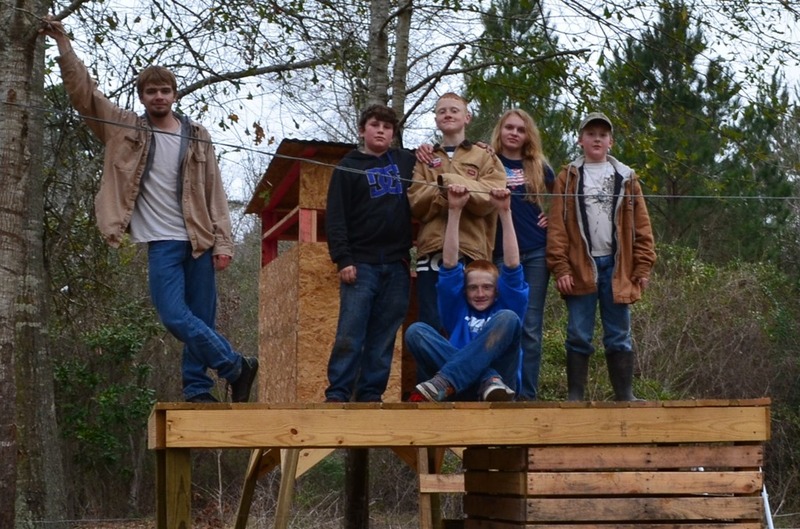 I am so glad my kids have such great friends… it’s memories in the making! 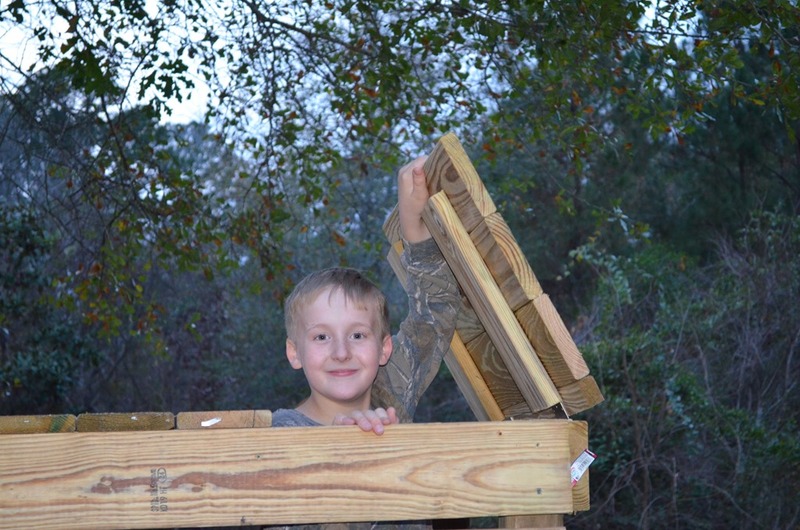 Posted on January 3, 2014, in Family Fun, Homeschool and tagged Woodworking. Bookmark the permalink. Leave a comment.